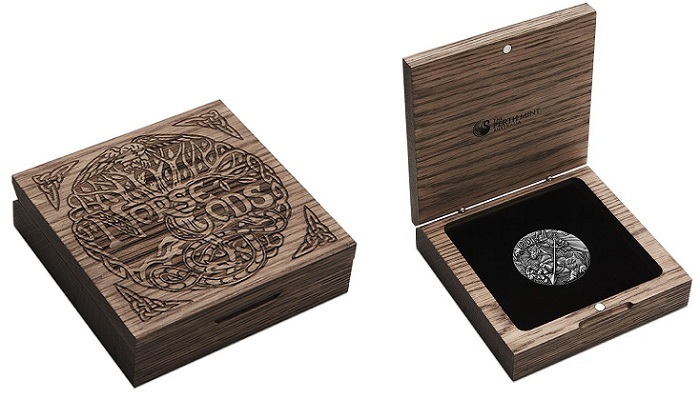 The Perth Mint has released the 2016 Norse Gods – Odin 2 oz. Silver High Relief Antiqued Coin, which has a mintage limited to 2,000 pieces and is available for $180.91 AUD ($129.21 USD). The coin is the first in a three-coin series from the Perth Mint featuring Norse gods. This two-ounce rimless piece is composed of 99.9% silver, with an antique finish, a diameter of 40.50 mm, and a thickness of 6 mm. The reverse, designed by Ing Ing Jong, carries an image of Odin riding his horse, Sleipnir, while holding a spear. A wolf and raven accompany him, and the inscriptions ODIN and the Perth Mint’s “P” mint mark are included near the rim. Odin is known in Norse mythology as the king of the gods and is traditionally held to be the god of war, death, the sky, wisdom, and poetry. He is said to have sacrificed one of his eyes to drink from the fountain of wisdom. The obverse features Ian Rank-Broadley’s portrait of Queen Elizabeth II. 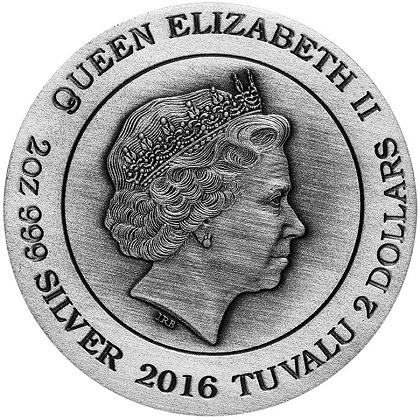 Included along the rim are the inscriptions QUEEN ELIZABETH II, 2 DOLLARS, 2 oz 999 SILVER, 2016, and TUVALU, the issuing country. The coin comes in an engraved wooden display case with a certificate of authenticity. Future releases in this series will feature Norse gods Thor and Loki. For more information on the 2016 Norse Gods – Odin 2 oz. Silver High Relief Antiqued Coin, please visit the Perth Mint’s Web site. 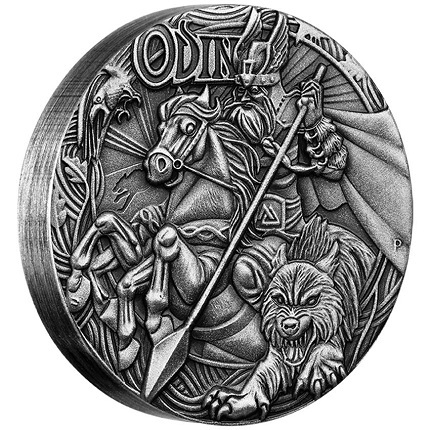 Update, 3/24/16: The Perth Mint has announced that the 2016 Norse Gods – Odin 2 oz. Silver High Relief Coin has sold out of its 2,000-piece mintage.